This page contains images that can’t be found elsewhere on-line, and reference both the three-dimensional and e-book versions of Right Off the Bat. 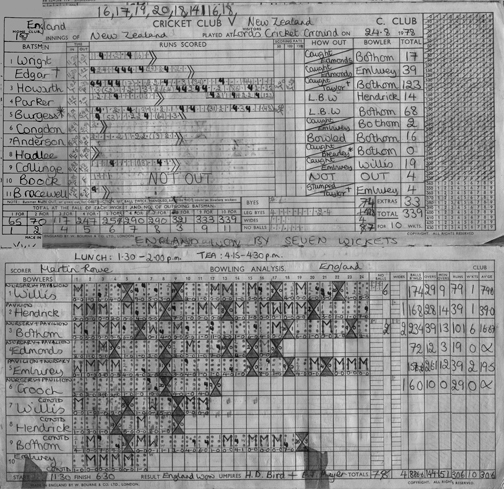 Martin’s score sheet for New Zealand’s first innings, August 1978. Private collection of Martin Rowe. 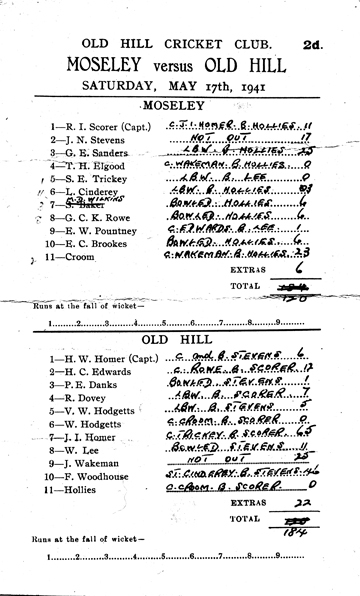 A Moseley scorecard, with Geoffrey Rowe batting at number eight. Geoffrey was bowled by Eric Hollies, who seven years later was to do the same to Don Bradman for 0. Geoffrey always proudly noted that he got six more runs than “The Don.” Private collection of Martin Rowe. 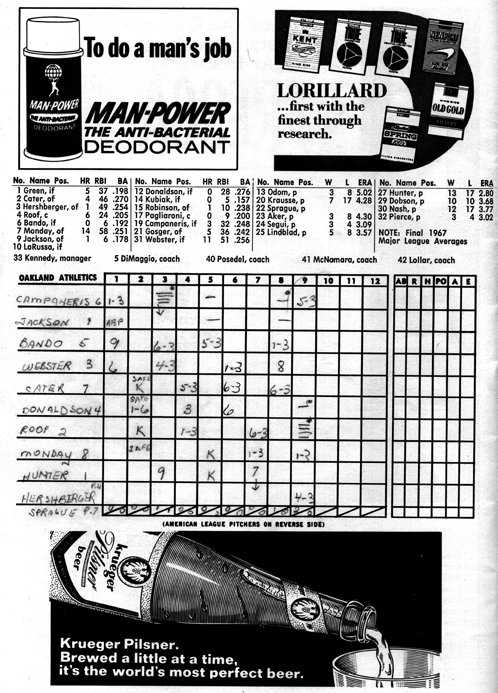 Evander’s scorecard of the Yankees and the Oakland Athletics, spring 1968. Private collection of Evander Lomke. 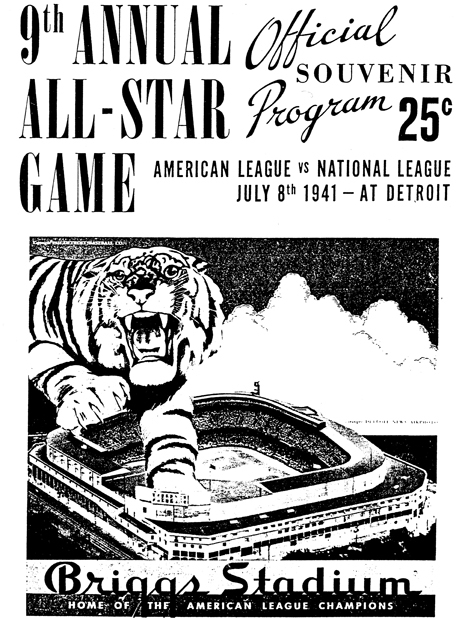 The program and scorecard for the 1941 All-Star Game in Detroit, home of the Tigers. These annual exhibition games showcase the best players from the National and American Leagues in hard-fought but friendly competition. Five months, to the day, after this All-Star Game—one of the best ever played—the U.S. would declare war on Imperial Japan and the Axis Powers. Uncredited image from The DiMaggio Albums, Selections from Public and Private Collections Celebrating the Baseball Career of Joe DiMaggio, volume 1, 1932–1941, compiled and edited by Richard Whittingham. New York: G. P. Putnam’s Sons, 1989. 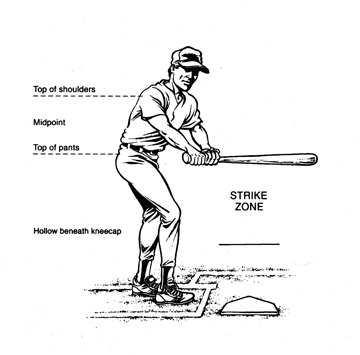 The official strike zone of Major League Baseball. The 2007 Major League Baseball Umpire Media Guide. Copyright 2007, the Office of the Commissioner of Major League Baseball. 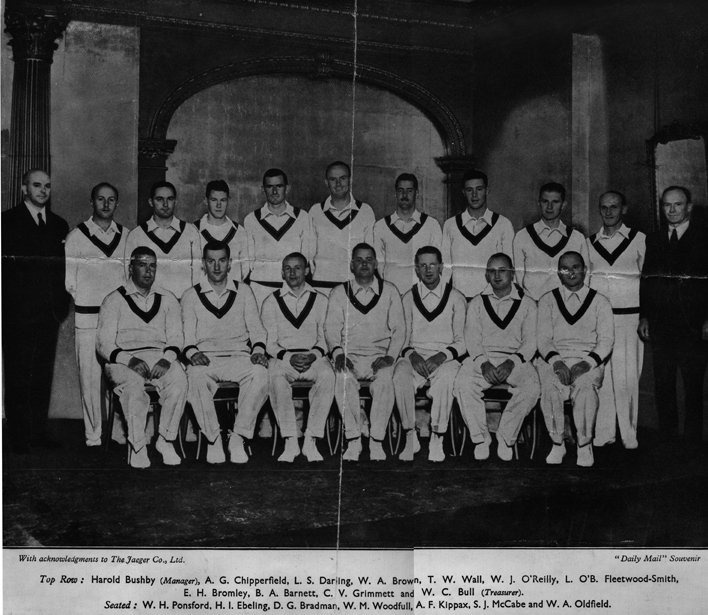 The 1934 Australian team. Donald Bradman is seated in the front row, third from the left. Daily Mail souvenir, with acknowledgment to The Jaeger Co., Ltd. Private collection of Martin Rowe. A pocket schedule for the 2010 New York Yankees. 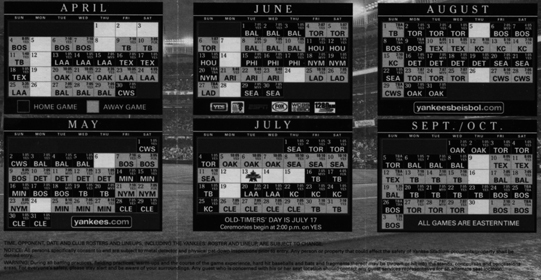 Note how the schedule is arranged in series of two, three, or four games. (When the long season ends, Evander always feels a piece of him has died with it.) Private collection of Evander Lomke. Lou Gehrig (left) and Babe Ruth in 1927 during one of their celebrated postseason barnstorming tours. 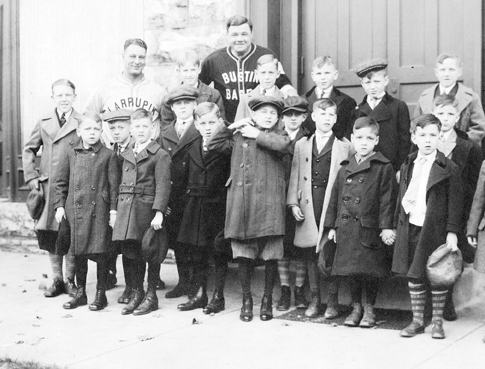 They are seen visiting St. Patrick’s Orphanage (Sisters of St. Joseph), Watertown, New York. The boy at the far left is the father of psychologist Dr. William Van Ornum, who provided the photograph. Private collection of Dr. William Van Ornum, Copyright 2011. Robert Clayton “Bobby” Shantz stood only 5 feet 6 inches tall, but pitched for sixteen stellar seasons on pure athleticism and craft. Here, Shantz demonstrates his grip for three wily pitch selections that frustrated and baffled batters in his best season, 1952, when he was credited with winning twenty-four games, nearly one-third of the total won by the Philadelphia Athletics. The Story of Bobby Shantz, as Told to Ralph Bernstein by Bobby Shantz. Philadelphia and New York: J. B. Lippincott. Copyright 1953 by Robert C. Shantz and Ralph Bernstein. Courtesy of Bobby Shantz. 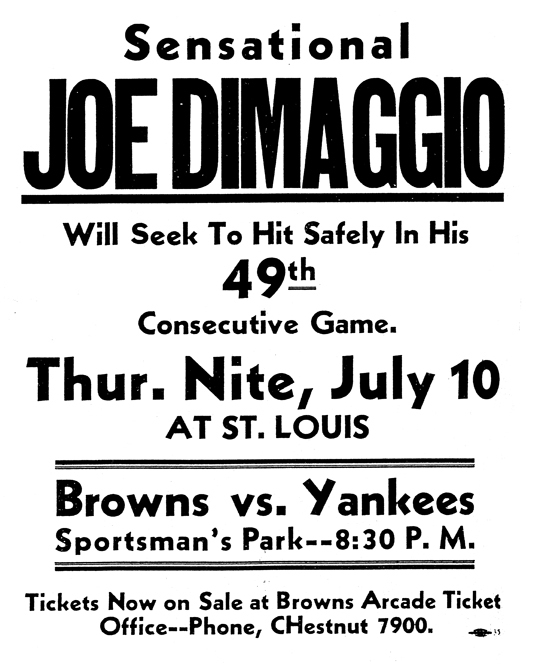 Joe DiMaggio’s mind-bending hitting streak, which ultimately reached 56 games, remains a feat of unparalleled will and excellence. Note that the game starts about an hour later than games of today, even though it would end at roughly the same time. The reasons for games taking longer are several: more player substitutions, more time taken between pitches, and television advertising breaks. From The DiMaggio Albums, Selections from Public and Private Collections Celebrating the Baseball Career of Joe DiMaggio, volume 1, 1932–1941, compiled and edited by Richard Whittingham. New York: G. P. Putnam’s Sons, 1989. Collection of the late Barry Halpern. 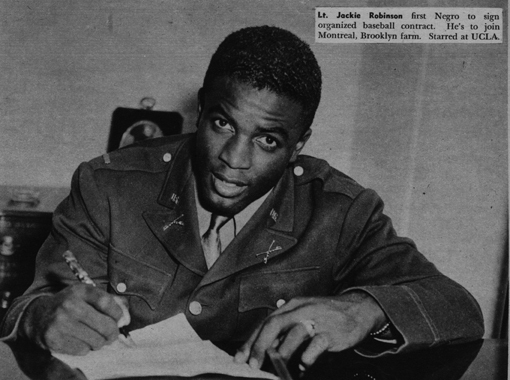 Jackie Robinson. Robinson contended with prejudice the best way: through excellence of character and performance. 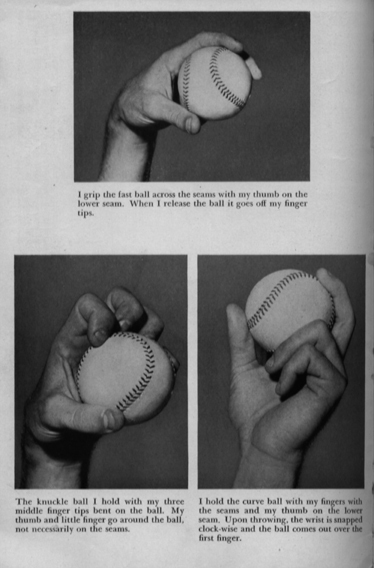 From Street & Smith’s Baseball, 1946. 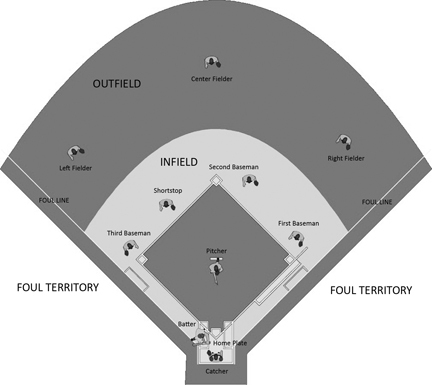 Copyright 1946 by Street & Smith Publications, Inc.
Standard fielding positions in baseball. Adapted from the Collinsville Baseball website. 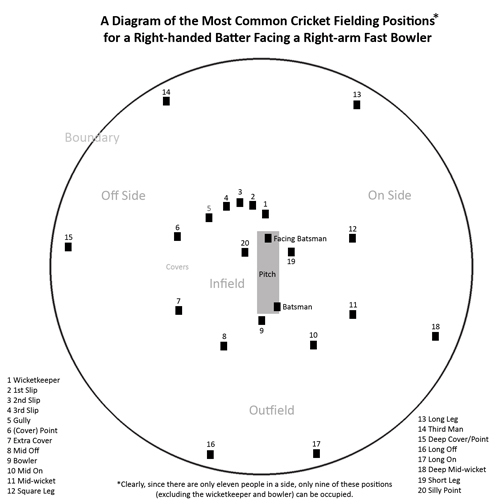 The most common cricket fielding positions for a right-handed batter facing a right-arm fast bowler. Note that since there are only eleven players on a side, only nine of these positions (in addition to the wicketkeeper and bowler) will be occupied at any one time. Copyright 2011 by Martin Rowe. A friend told me about New Books in Sports and I have been slowly working my way through all of the podcasts. They are all very engaging and I have been tempted on more than one occasion to purchase the book. With great resolve I have resisted. However, I enjoyed listening to you so much that I bought a copy of your book. I live in Adelaide about one mile away from The Don’s house and teach PE and coach cricket at an Adelaide school in the southern area. I also help out at Kensington District Cricket Club, which is Bradman’s former club, scoring and assisting with training. Forty years ago, when I was 15 and playing for Kensington, I had a moment that Martin described. A quickish bowler sent down a half volley that I caressed and instead of going to the fieldsman at cover it sped off the bat for three. The memory is as clear as it happened yesterday. My understanding of baseball still needs some serious work, but I believe the two games have a lot more in common than is superficially observed. The Australian cricket team have had a fielding coach that was an American baseballer. As for the three most significant baseball and cricket people, I made my choices while listening to the podcast and before you mentioned yours. Baseball-Babe Ruth, Joe DiMaggio, Jackie Robinson. Cricket-Don Bradman, Shane Warne, Kerry Packer. Thanks, Nick, for sharing your story, and for your kind words about our book. Spread the word! We’re glad that you could get it in Australia. I (Martin) did an interview with Barry Nicholls of ABC radio in Australia, which we hope will be up as a podcast in due course. So, be sure to check back regularly on rightoffthebatbook.com. PS Barry was the friend. Hi Nick! Evander here to echo Martin’s thank you. (Martin is conducting his own seventh-inning stretch/tea interval these days. Thus, the most recent podcast, posted today, is my “solo” solo venture.) I, too, am grateful to Barry Nicholls, and especially to you for going the extra mile in finding our book. Please do pass the word along. As you recognize, via a comparison of six superstars, there are some astonishing parallels between cricket and baseball, and plenty of fun for everyone.